While it is the intention of the Rand Desert Museum to have each claim posted in to the CLAIMS portion of each town this may not happen for some time while the mechanics of the Claims section are worked out. In the mean time we are posting that information here so that is available to you. When we get the CLAIMS portion of the web site up and working it will be much easier to conduct a search of a specific claim or claim owner. 1962: “Located –NW ¼ NE1/4 sec. 11m TS30, R40E, MDM 1 ½ miles south of Randsburg.—Five claims. Six shafts inclined approximately 55 degrees to north, 3 vertical shafts from 50 to 185 feet in depth with drifts as long as 250 feet. Principal mining done 1899 to 1902, 1928, 1937-1941 and 1946 -1947. Production reported to be valued at $120,000.” – Mines and Minerals of Kern County California, California Divisions of Mines and Geology, County Report 1. June 29, 1923: “UNITED MINES ORDERS RESUMPTION OF WORK –Randsburg, June. 29.—The resumption of work on the United Mines, a gold property two miles southwest of Randsburg was ordered this morning and a crew of men placed at work getting things in shape for operations. The United Mines is controlled by Bakersfield people and in the past has been one of the rich producers of the district, more than $125,000 having been taken from shallow workings. Officers of the company are: C. R. Hannaman, oil producer, Kern River field, president; S. A. Miller, superintendent, Junction Oil Company, vice president; M. C. McVann, gauger, Union Oil Company, secretary: H. E. Osborn, engineer Pacific Oil Company, Treasurer. 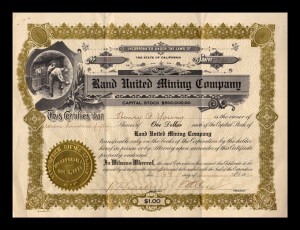 September 10, 1923: “GOLD ORE WORTH A DOLLAR THE POUND REPORTED IN NEW RANDSBURG STRIKE –Gold ore carrying values exceeding one dollar per pound has been discovered on the property of the United Mines Incorporated, according to an announcement made by S. L. Pearce, consulting engineer, who is in active charge of operations. The high-grade ore has been found in the stopes of three of the old shafts which were sunk many years ago, in the early days of the stringer district excitement, by leasers. This latest discovery of rich gold ore will give a great impetus to mining and prospecting in the stringer district, it is believed, and will result in opening up a large number of old workings that have not been touched for many years. Several leases already have been signed, it is reported, and a number of options are out for claims in that section. Due to the fact that the old working shafts and stopes of the United Mines caved badly since the ore bodies were worked, it will be necessary for the present management to continue sinking in their main shaft, which is 300 feet away from the high-grade, until a depth is attainted which will permit them to come up under the gold-bearing veins. This work will be consummated with the greatest haste, however, according to Engineer Pearce. As the deepest of the old workings is only 120 feet, no great time should elapse before the extent and richness of the pay shoots will be definitely known. “We will continue to sink our working shaft until we reach the 200-foot level,” said Pearce. “At this point we will cut a station and drift on the vein matter until we are under the ore deposits now exposed in the old stopes. We have what has been pronounced the best equipped plant in the district, and it will be our policy to develop the ore bodies we have discovered in the least possible time consistent with economical mining. “We began work at the United Mines July 1, and since that time we have devoted our entire attention to locating the ore deposits which geology and legendary history told up were there. But the richness of the discovery has far surpassed our expectations. September 14, 1923: “RICH ORE IS REPORTED BY MINERS –High grade gold ore worth as high at $2000 a ton, possibly more, was discovered last week on the old Bully Boy claim now operated by the United Incorporated which is a company made up of Kern river and west side oilfields men. “These recent discoveries are so rich that they overshadow any made in this district for some years past.” said S. L. Pearce, the engineer in charge of operations at the mine. The United Mines Incorporated will hasten development work and as soon as sufficient ore is blocked out a mill will be erected at the mine. Tradition says that ore worth $3 a pound has been taken from the old workings. The discovery last week was somewhat in the nature of a rediscovery as the Bully Boy had previously been worked by itinerant prospectors and $125,000 worth of ore taken from it. The early workers of the mine had sunk three shafts. A new impetus will undoubtedly be given to mining in the vicinity of the “fund” (sic). January 16, 1924: “UNITED MINES INC. PLANS OPERATIONS –Propose to Install New Mill at Property Near Randsburg—At a meeting of the board of directors of the United Mines, Inc., held here for the purpose of formulating plans for the operating of the company during the present year, M. D. Griffith, a prominent resident of Hollywood, was elected a member of the board of directors. Griffith is a member of a pioneer family in the south, being a son of Colonel Griffith, donor to the city of Los Angeles of Griffith park, and well known in the south as a big game hunter. He is also an expert mining man and assayer and his experience as such is considered a valuable addition to the board. The board of directors is planning on a policy of greater expansion during the coming year and is negotiating for the acquisition of other property in the Rand district, and plans to commence the immediate construction of a Chilean slow speed roller mill with a capacity of 40 tons per day. The company has been engaged in active development work for the past year, and while running a drift from the original shaft on the Bully Boy claim disclosed a quantity of free gold ore which assayed $2000 per ton. Work is now being pushed on a second shaft for the purpose of facilitating the blocking out of the ore, pending the construction of the mill. Most of the work on the property has been done on a narrow vein which, though narrow, varied considerably in thickness and is said to have carried good values. Much of the upper part of this vein was stoped years ago. The vein strikes N. 65 degrees E., dipping 53 degrees N.
The claims held by the United Mines Company are credited with a past production of about $120,000 in gold. . — Hulin. 1962: “Located NE ¼ sec 11, T30S, R40E, MDM, Stringer district, 2 miles south of Randsburg—Napoleon, Santa Ana, and Yucca Tree patented claims. Total output of several thousand ounces of gold in 1897-1902 valued at $400,000 and 1905 -1918 and few hundred ounces at intermittent intervals between 1926 and 1942. Most of the gold obtained from Napoleon claim which is credited with an output of $100,000. Very little gold credited to Yucca Tree claim. Minor amount of lead obtained from concentrates shipped in 1937. Tungsten output undetermined. Developed by about 20 shafts from 50 to 150 feet deep and an undetermined amount of drifts. .” – Mines and Minerals of Kern County California, California Divisions of Mines and Geology, County Report 1. 1962: LOCATED IN SE ¼ sec. 11, T30S, R40E, MDM, Stringer district, 2 miles south of Randsburg. One patented claim. The principal mining was in 1905-1908, 1910, -1912, and 1933- 1936. Total gold output is several hundred ounces from ore that averaged ½ to 2/3 ounces per ton. Tungsten output undetermined but probably a few hundred units. The mine was developed by 10 shafts on the south part of claim to maximum depth of at least 300 feet and a few thousand feet of horizontal workings. Stopes extend to surface along large part of the stringers. There are lesser workings on north part of claim. It has been mined by several lessees and small mining companies. – Mines and Minerals of Kern County California, California Divisions of Mines and Geology, County Report 1. January 24, 1897: “A PARTY CONSISTING OF G. W. Chrisman, Leon Cerf, James Daly, and E. E. S. Hall of Ventura, G. L. Chamberlain, Mr. Forbes and the writer (C. J. McDivitt) of Randsburg, started out southwest yesterday to see the mines. The first one visited, was the Mattie, Mr. Wilkinson the owner and three men were at work and had quite a pile of sacks on the dump. Next the Bully Boy was visited, but no one was at work, and no information could be obtained. Just over the hill the Yucca Tree was passed. Here a great deal of work has been done and much rich ore has been taken out. It is now owned by Koehn and O’Brien and has a shaft down a hundred feet. It is not now being worked on account of some legal troubles which are in process of adjustment. A little beyond is the Winnie Mine, one of the best in the district. This mine is also owned by Koehn and O’Brien, and here we found Mr. O’Brien superintending operations. There is a shaft seventy feet deep on this mine and they are now drifting both ways. The ore at the bottom goes $70 per ton while one place higher up in the shaft four tons of ore were taken out which milled $300. Mr. O’Brien offered any of the party the privilege of going down into the mine and examining it if they wished. May 27, 1898: “THE STRINGER DISTRICT is now proving the richest part of the Rand Mining District, and no portion of it has produced better that the Napoleon, owned by Pridham, Munsons & Layton. The main shaft is now down 170 feet, with richer rock at the bottom than ever. In the whole distance the shaft has paid $70 per foot. The ore is the most absolutely free milling ore in the district Times. The Merced in the same district, and only a short distance to the southwest, has an almost equally good record, and it is again being worked. The best miners in the district give it as their opinion that somewhere in the Stringer district will yet be struck the best and richest mine yet discovered. The whole surface is seamed and crossed with small veins of rich quartz, carrying coarse gold, and there are undoubtedly offshoots from some larger vein as yet undiscovered. .” — Los Angeles Daily. October 3, 1903: “THE MERCED MINE, near Randsburg, has been incorporated, and R. L. Owens of Saticoy, Ventura County, is president. The company will sink a shaft to open the Santa Ana Lead.” – The Mining and Scientific Press. Just blow lies the Merced with stringer of the richest quartz running in many directions. Upon this property several leasers are at work and all doing well. At every shaft many tons of ore are sacked, waiting to be milled. This is perhaps as rich as any section around Randsburg, but the veins of ore are small and particularly adapted to being worked by men of small means. Most of the leasers give one-fourth net to the owners, which, as all mining men know is a high rental. In this immediate vicinity there were perhaps a hundred men at work, a drive of a mile farther and about three miles from Randsburg, is the Marvel mine, owned by Mathewson and Faust, with Mr. Faust in charge. The principal shaft is forty- five feet and they are drifting on either side. There is a good ledge with ore that from tests run with a mortar and horn spoon, runs $100 a ton. This mine has been worked for about two months, and they have 20 or more tons of ore sacked, not having yet milled any of it. Mr. Faust is a young man who was taking a college course at the Occidental College in Los Angeles, and during his vacation and during his vacation thought he would go out on the desert and do a little prospecting, with the luck of finding one of the best mines in the district. Perhaps a professional career was spoiled, but a good miner might make up for the loss. Around this mine is a group of five tents all occupied by men engaged in prospecting or developing something already found, and there are all together, at Camp Marvel, as the place is called, about sixteen men. September 30, 1899: “FORFEITURE NOTICE –To W. H. Faust, and all others who may claim an interest in the Marvel Mine, you and each of you are hereby notified that we have expended during the year, 1898, one hundred (100) dollars in labor and improvements on the above quartz mine, located in the Rand mining district, County of Kern, State of California, which location certificate is found of record in the Rand mining district records, in book 4, page 83, above county and state, and recorded November 12, 1896, in order to hold said claim under the provisions of section 2324 of the revised statutes of the United States and the amendments thereto approved January 22, 1880, concerning the annual labor upon quartz claims, being the amount required to hold said claim for the period ending December 31, 1898. And if within ninety (90) days from the personal services of this of this notice, or within ninety (90) days after the publication thereof, you fail or refuse to contribute your portion of such expenditure as a co-owner, your interest in the said claim will become the property of the subscribers, your co-owners who have made the required expenditure by the terns of said section. Dated this 29th day of July 1899. January 28, 1897: “IT IS ALSO REPORTED TODAY on good authority that Mr. Harper of the firm of Harper and Reynolds, Los Angeles, had purchased the Standard Mine adjoining the Kengar (sic) on the west and South and covering quite a portion of the town of Randsburg. The consideration was $12,000” — Los Angeles Times. March 1899: “HARLEY KERNSH arrived in camp in May, 1895, less than a month after the first discovery of gold by Burcham, Singleton and Mooers. He immediately made some valuable locations, many of which he still owns, among them the Trilby Extension, and the Standard, the latter of which is on the northern edge of the town, and near the Kinyon and Little Butte mines. There has been some very rich ore found on it very recently, and it is liable to become very valuable. He located the Wedge mine in April, 1896, on which he had a shaft 65 feet, at which depth some very rich ore was found, some of it going as high as $300 to the ton. He sold it to J. W. Rodgers, and it is well known that it has since produced over $100,000. He is also the owner of the Golden Bow mine, near the Yellow Aster Company’s mine, which is liable to prove very valuable” – McPherson. The mine has 1,100 feed of underground development in the levels. Shipping ore has broken from a vein several feet wide. The ore body on the main level is 29 feet wide; of which eight feet is shipping grade. The owners, C. Thorndike, who is the manager, and D. McMillan, of Laws, estimate that over a million tons of ore is blocked on two sides. 1962: REPORTED TO HAVE BEEN at sec. 33, T29S, R40E, MDM, Rand dist., 1 ½ miles west of Randsburg. The prospect was developed by 25 foot shaft, 25 foot incline shaft, and 50 foot incline shaft, 100 feet of open cuts, 500 foot of tunnel (crosscuts?) and 50 feet of drifts.” — Mines and Minerals of Kern County California, California Division of Mines and Geology. September 15, 1896: :DEFENDER MINED (quartz) – This is one of the new discoveries in the Mojave Desert, ¾ mile East of Randsburg, at 4,550’ altitude. A strong rich vein of rich quartz is exposed in an open cut. E. B. Maginnes (sic) et al, of Randsburg, owners.” California State Mining Bureau, Thirteenth Report of the State Mineralogist for the Two Years Ending September 15, 1896. September 15, 1896: “DOS PICANNINI (quartz) – It is in Fiddler’s Gulch, 1 mile East of Randsburg, at 3,400’ elevation. The development consists of a shaft 40’ deep, following the vein on a 40 degree slope. It is an extension of the Maria and on the same vein. Benson Bros et al, of Randsburg, owners. ” California State Mining Bureau, Thirteenth Report of The State Mineralogist for The Two Years Ending September 15, 1896. September 15, 1896: “MARIA MINE (quartz) – It is in Fiddler’s Gulch, 1 mile E. of Randsburg, at 3,400 elevation. It is a new discovery on a 10” to 24” quartz vein, dipping to 40 degrees S. The incline shaft is 40’ deep. Benson Bros. Et al Randsburg, owners. ” California State Mining Bureau, Thirteenth Report of The State Mineralogist for The Two Years Ending September 15, 1896. September 15, 1896: “REPUBLIC MINE (quartz) – It is 2 ½ miles S.E. of Randsburg, at 3150’ altitude. It is a new discovery on the same vein as the Hawkeye. P. O. Fifield, of Randsburg, owner. . ” California State Mining Bureau, Thirteenth Report of The State Mineralogist for The Two Years Ending September 15, 1896. September 15, 1896: RUSTLER AND SAN DIEGO MINES (quartz). They lie ¾ miles E. of Randsburg, at 4650’ elevation. They are new locations on the vein of the Olympus which they adjoin. A 60’ tunnel is run into a mass or vein of gold bearing quartz. E. B. Maginnis et al, of Randsburg, owners. State Mining Bureau, Thirteenth Report of The State Mineralogist for The Two Years Ending September 15, 1896. December 1, 1911: “TUNGSTEN AND GOLD MINING—Work at Placers Near Randsburg Progressing Nicely.—The work at the placer grounds between here and Atolia is progressing satisfactorily. One machine is in active operation and produces good results. The concentrates are rich and carry good values in gold and tungsten. Another machine is on the way and will soon be set up. August 24, 1912: “AN ENTIRELY NEW PLANT of much larger capacity has been installed by the Placer Gold Mining Company on the Baltic grounds, one of the 18 claims owned by this company. Operations have been started at once. October 22, 1912: “GOLD MINING AT RANDSBURG –Eight men are usually employed in the operation of the plant of the Placer Gold Company in the stringer district. A sand pump has been installed to remove the slime and sand which accumulated in the settling tanks. An amalgamating barrel was set up for treating the large amount of concentrate which has been collected. 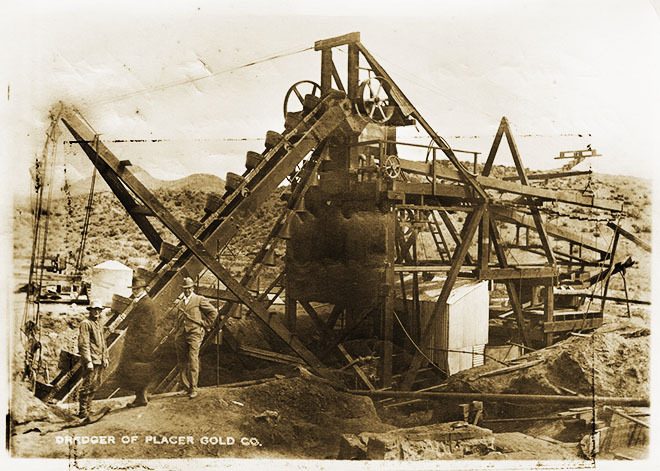 December 1, 1912: “PLACER GOLD COMPANY TESTS—The test runs at the plant of the Placer Gold Company, a little south of Randsburg met with so much success that it was decided to enlarge the plant and to begin concentrating of the gravels on a large scale. Six-foot steel sluice boxes will be installed and the elevators enlarged to handle the increased tonnage. December 15, 1912: “PLACER CO. ERECTING RESERVOIR FOR DUMPING—Cummings Separator Is Installed to Separate Gold and Sheelite.—Randsburg, Dec. 14.—A reservoir 90×60 feet in size, has been built by the Placer Gold Company south of their plant during the past week, which will be used as a dumping ground for the tailings from the sluice boxes. Two elevators, 80 feet in height have been erected, which will move the tailings from the plant into steel sluice boxes, 150 feet in length. Another pump has been installed at the settling tanks to pump water into the tailings sluices. The tailings are flushed into the reservoir, from where the water is drained back into the settling tanks. A Cummings separator has been installed to separate the gold, scheelite, and black sand. An analysis of the black and is worth from $45 to $65 per ton in gold alone. December 16, 1912: “ACTIVITY IN PLACER WORK – A reservoir 90×60 feet in size has been built by the Placer Gold Company south of their plant during the past week, which will be used as a dumping ground for the tailings from the sluice boxes. Two elevator’s thirty feet in height have been erected, which will raise the tailings from the plant into steel sluice boxes 150 feet in length. Another pump has been installed at the settling tanks to pump water into the tailings sluices. The tailings are flushed into the reservoir, from where the water is drained back into the settling tanks. December 24, 1912: “PLACER GOLD COMPANY –Many improvements for the more economical handling of gravel and tailings have been installed lately at the plant of the Placer Gold Company, located one mile south of Randsburg. B. Coppock of Los Angeles, secretary, was here inspecting the plant of the company. December 28, 1912: “HARMON R. WYNN TO SIDNEY COBURN –$20 White Horse, Lode Claim, Rand District. Harmon R. Wynn to Sidney Coburn, $10; Fairchild Lode, the Marguerita Lode, both in Rand District. January 12, 1913: “PLACER GOLD’S NEW MILL – Gravel rapid reduction mill is being installed on the grounds of the Placer Gold Company. January 13, 1913: ‘PLACER GOLD COMPANY–E. Coppock, of Los Angeles, Secretary of the Placer Gold Company, arrived here Monday in company with Oscar C. Beach, representative of the Braun Corporation of Los Angeles. Mr. Beach is installing a Braun rapid reduction mill on the grounds of the Placer Gold Company. This mill will be used to pulverize the concentrates so the scheelite can be separated from the gold by the Cummings concentrator, recently installed. The Braun rapid reduction mill has a capacity of three tons in ten hours and requires only three horse-power. January 26, 1913: “ELECTRIC POWER FOR PLACER GOLD MINE –Places Order With Southern Sierras Co.; Mining New of Rand District.—Randsburg, Jan. 26. –Electric power will be used in the operation of the large plant of the Placer Gold Company, which owns extensive placer grounds one mile and a half south of Randsburg. The contract for electric power was signed this week between Placer Gold Company and the Southern Sierras Power Company. January 27, 1913: “ELECTRIC POWER FOR PLACER GOLD –Electric power will be used in the operation of the large plant of the Placer Gold Company, who owns extensive placer grounds in the Rand district, one mile and a half south of Randsburg. The contract for electric power was signed this week at Los Angeles between the Placer Gold Company and the Southern Sierras Power Company, whose power line runs past these placer grounds. The trial runs undertaken at the plant of the Placer Gold Company have established the feasibility of this process of gold extraction and proved the success of the undertaking. The pipe line of this company connecting with the pumping plant at the Johannesburg railroad station has been repaired. The recent cold weather caused only slight damage to this pipe line. The electric motors for the elevators and pumps of the sluicing plant are on the way and the distillate engines will be taken as soon as the power is available from the sub-station of the Southern Sierras Power Company. April 6, 1914: “PLACER GOLD COMPANY—The new dredger elevator of the Placer Gold Company is working as smooth as possible. The power to the machine and pumps is supplied by variable speed electric motors. At a working trial the machine handled 315 yards of pay dirt in eight hours.” –Bakersfield Morning Echo. September 26, 1914: “MACHINERY –MINING GAME, AND ESPECIALLY PLACER WORK, BOOMING AT RANDSBURG –Showing the way the mining business is booming at Randsburg. C. D. Crain, superintendent of the Placer Gold Company there contemplates installing new and more powerful machinery in the near future, some of the machinery now being shipped from Los Angeles. Crain states that best results can be obtained by increasing the output of which at present they are handicapped by the lack of water and the small amount of gravel that stacker conveys, as this necessitates running the large elevator at less than its regular speed. The peculiarities of this placer district is the distribution of scheelite and gold in the placer gravels. Where tested to bed rock, about 75 feet at this particular point the gravel is placed at $3 to $4 per cubic yard, about $2 in scheelite, a high grade tungsten mineral and the rest in gold. The method used by the Placer Gold Company to obtain the scheelite and the gold, and to separate them, consists of raising the gravel by a 35-foot elevator into a steel sluice box flume 100 feet in length, with a depression or grade of one and a half in the foot. The steel flume is sixteen inches high with riffles two and a half inches deep. The product goes through a revolving screen and that which passed through the screen is run over 200 square feet of steel tables covered with cocoa matting and Brussels carpet. The tailings are hoisted by elevator to another sluice box and the water that goes through the sluice flume is repumped to wash the tailings to the dump. The clean-up of the sluice boxes is put through a pulverizer in a 24-inch mesh and run over a separator. From the separator the portion of gold and tungsten not separated is put into amalgamator barrels. MABLE S. / MABEL S.
1962: “THE MONARCH RAND GROUP is located in SE1/4 sec, 1, T30S, R40E, MDM. It is approximately 60 acres of patented land. Development consists of vertical shafts from 200 to 600 feet deep with about 500 feet of drifts appended at several levels. Deep shafts were developed in search for silver ore. Few hundred ounces of gold and undetermined amount of scheelite were produced in 1930’s and early 1940’s from placer material.” – Mines and Minerals of Kern County California, California Division of Mines and Geology, County Report 1. 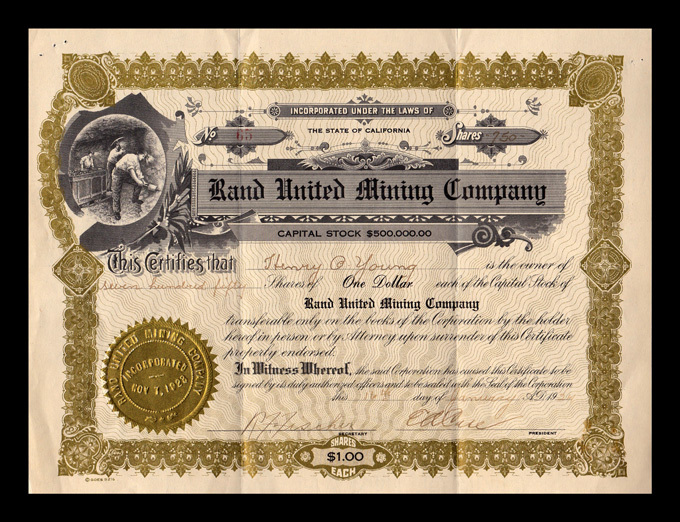 August 15, 1924: “MONARCH RAND MINES REPORTED TO START SOON. Funds from the last assessment are reported as coming in fast and freely and that it is expected in a very short time, sufficient will be in the treasury to pay up, and then to begin the work a new and push it vigorously. The Monarch Rand Company has 1500 acres of ground and when developed this will make money for all concerned is the view or mining men who know the property. The entire Rand district is anxious to see this company make good and it has at its head some very capable men who are certain at some time to make a success of this big property. There are many men whom the company owes accrued wages who will also be pleased to hear of the new move to improve, for they have sadly needed their accumulated and unpaid earnings, which are now promised to be paid soon. May the Monarch Rand “come back” stronger, better and more virile than ever! News of the greatest importance is contained in the fact that early this week the directors of the Monarch Rand Mining Company held a meeting in Tulare and took up the matters of the mining development falling to their lot, and voted to levy an assessment of 12 per cent on the stock and go on with the work of making their property into a big mine. March 1925: “THE ORIGINAL WORKINGS of the Monarch Rand Mining Company were approximately 1600 feet southeast of the Baltic Shaft. The Monarch Rand-Shaft, now known as the Monarch No. 1, is a 1 ½ compartment vertical shaft, now 450 feet deep. It is planned to sing to 700 feet. Stations have been cut at 118, 168, and 218 feet. One vein, 3 ½ feet thick, has been found in this shaft which was said to assay $48.00 chiefly in gold. This vein which lies on the hanging wall of a quartz latite dike was cut off on top, bottom and both ends by faults. 100 tons of ore were taken from the No. 1 shaft. The Monarch Rand Mining Company have recently acquired the Baltic claim, including the old mine and mill, and also the property formerly known as the Ben Hur Extension. 1962: THIS PROSPECDT WAS LOCATED IN NW ¼ sec. 1. T30S, R40E, MDM, of the Rand district, 1 ¼ miles southeast of Randsburg. It has a vertical shaft of undetermined depth. There was probably no production when it was worked in the 1930’s. – Mines and Minerals of Kern County California, California Division of Mines and Geology, County Report 1. 1962: LOCATED IN THE NW ¼ sec. 12, T30S, R40E. MDM, Stringer district, 2 miles southeast of Randsburg. Discovered in 1896 and mined mostly in 1905-1906, 1911, 1928-29, and 1934-1935. Principal output was in 1911. Total output is few hundred ounces of gold from ore the averaged about 0.4 oz. gold per ton. Orphan girl vein is developed by a 370-foot inclined shaft with drifts totaling 500 feet on 3 levels. – Mines and Minerals of Kern County California, California Division of Mines and Geology, County Report 1. 1962: LOCATED IN NE ¼ sec. 11, T30S, R40E, MDM, Stringer district, 2 miles south of Randsburg. A small fraction between Merced and Santa Ana claims. There are three shafts to depths of 250 feet and probably a few hundred feet of drifts on several levels. The total output t of the mine was a few hundred ounces of gold in 1909-1910 and 1936-37. The amount of tungsten output is undetermined. . – Mines and Minerals of Kern County California, California Division of Mines and Geology, County Report 1. 1962: THIS GROUP OF CLAIMS ARE LOCATED IN THE NW part of sec. 4, T30S, R40E, MDM, Rand district, 2 miles west-southwest of Randsburg, northwest slope of Rand Mts. Claims were owned by Sam Mingus of Randsburg. There were approximately 8 claims, developed by exploration shafts and drifts, with probably no production. . – Mines and Minerals of Kern County California, California Division of Mines and Geology, County Report 1. September 19, 1903: “THE PYRAMID MINE is being developed by the Verification & Development Co., 4 miles south of Randsburg. 1962: THE RATTLESNAKE was reported to be in the Rand district, about 1 mile south of Johannesburg in 1910, somewhere in the vicinity of Wade H. group. – Mines and Minerals of Kern County California, California Division of Mines and Geology, County Report 1. 1962: THE RED BIRD IS LOCATED IN THE SE ¼, T30S, R40E, MDM, 1 ¾ miles southeast of Randsburg in the Stringer district, adjoining the south boundary of the Baltic. It is developed by 135 foot vertical shaft at east end of claim and 500-foot inclined shaft 500 feet to the west. Shafts are connected by drift at 135-foot level. Small amount of scheelite has been recovered from placer material and sorted material from dump at vertical shaft. Several tens of ounces of gold were produced in 1930’s. . – Mines and Minerals of Kern County California, California Division of Mines and Geology, County Report 1. CHRONOLOGY: June 7, 1957: “RIDGECREST — Max Rizzardini and Bill Wilkerson were in Ridgecrest last Sunday with samples of gold bonanza quartz struck at a depth of 15 feet on Wilkerson’s claim adjoining the old Sunshine Mine at Randsburg in the Stringer District. Last Saturday they had decided to put in a finishing round and quit the claim unless some sign of ore was found. When they shoveled out the muck they found a glittering vein of quartz six inches in width and five feet long. Pannings from both hanging and footwalls show bonanza quality while the quartz has gold specks glimmering all over it. “If it gets much better it will be in a class with picture rock,” they said. March 12, 1904: “MESSERS. ROBERTS AND MATHEWS will commence milling from the Ruby next week.” — Randsburg Miner. September 30, 1899: “FORFEITURE NOTICE –To Reuben E. Stevens, Robert Dorsey, John Doe. You are hereby notified that we have expended for the years 1897 and 1898, one hundred (100) dollars each year in labor and improvements upon each of the following described claims, situated in the Rand mining district, County of Kern, State of California: The Indianapolis mine located August 20th 1896 and recorded in volume 3 page 59 Sept. 19, 1896. The Bully Binder mine located August 20, 1896 and recorded volume 3 page 59, Sept. 21, 1896: The Red Cloud Mine located Oct. 10 1896 and recorded in book 4 page 82, Nov. 4, 1896: The Josephine mine located December 30th, 1895 and recorded in book 1, page 24, all in the records of the Rand Mining District. Said expenditures being the amounts required by the United States mining laws under the provisions of section 2324 of the revised statues of the United States and amendments thereto concerning annual labor upon mining claims, being the amount required to hold said claims for the years ending December 31, 1897 and December 31, 1898. And within ninety (90) days form (sic) the date of final publication hereof, you fail, or refuse to contribute your portion of such expenditure as a co-owner your interest in the said claims shall become the property of the subscribers, your co-owners, who have made the required expenditure according to the terms of said section. The assessment work on the Red Cloud and Josephine is only for the year 1898. August 8, 1922: “A visit to the holdings of the Golden King United Mining Co. group of claims, located near the Sunshine, a famous gold producer in the days of the “stringer district” shows a scene of activity, mining, setting up of machinery and a number of buildings. Timber men have just set up the head frame over the 50-foot shaft; foundations in concrete are ready for the hoist, a Chicago pneumatic and other machinery. With nothing to delay of interfere, the resumption of sinking will be under way within two weeks, This shaft shows ore all the way down with good values, always showing $40 per ton, a high class milling proposition. This group of four claims is in the very heart of the many workings that poured hundreds of dollars in the yellow metal on the owners, miners, and dry washers, and about a quarter of a mile from the Yellow Aster domain and two miles from Randsburg over the paved highway. Within two weeks the Golden King will have all the looks of a regularly running mine, with the machinery in action, blacksmith and machine shop completed and several reservoir tanks in place, and both sleeping and dining quarters occupied. The sleeping quarters are not of the “bunk house” pattern but large single rooms with sleeping porches. The kitchen is about all a cook could desire, being equipped with everything new and running water aplenty. The dining room, like all the buildings, has a high ceiling, well ventilated, with a long porch running the full length of the building. The room will easily seat 40. Right at the kitchen door is an 80-foot tunnel that has been enlarged, making it an ideal place for fruits, vegetables and stores –a saving in many dollars in ice alone. September 2, 1922: “COMPLETE MACHINERY has been installed on the Golden King United, near the celebrated Sunshine Mine.” –Bakersfield Morning Echo. October 18, 1922: “MINING PARTNERS GO INTO COURT –Answer Is Filed in Action to Force Financial Accounting. H. B. Martin and B. M. Atkinson filed an answer to County Clerk F. W. Smith’s office today to and action brought by George A. Hill to recover sums alleged to be due from a partnership arrangement with the defendants, who are said to be owners of the Golden King United mining properties located in the Randsburg district. According to the bill of complaint filed by Hill, he entered into an arrangement with Martin and Atkinson whereby he was to share profits of the mining venture on a 50-50 basis. Hill has been unable to get any accounting from the defendants, it is averred, and seeks judgment of the court. In the answer filed today all the allegations of the plaintiff are denied by Martin and Atkinson, and a counter charge is filed in which Hill is accused of fraud and misrepresentation through which he was for a short time employed by Martin at a salary of $300 a month. It is averred that Hill represented himself to be an expert mining engineer, and to have served in that capacity in South Africa, when Cecil Rhoades was developing mining interests there. December 18, 1922: “CHANGE OF VENUE ASKED BY MARTIN IN MINING TRIAL — A motion to appoint a receiver for the Golden King United mines association, and also or a change of place of trial in an action brought against M. B. Martin, B. M. Atkinson, et. Al., in connection with mining properties near Randsburg, will be argues before Judge J. W. Mahon, in superior court No. 1, on Thursday of Friday, December 21 or 22. An order to than effect was made today by Judge Mahon, following notice given by Attorney John Mulligan, counsel for Martin, that we present a motion for trial in Los Angeles County. This entry was posted in Randsburg, Randsburg Mines. Bookmark the permalink.